When I was a kid, there was a tween game where you sat in a circle and clapped and called out “Categories! Names Of!” and then someone shouted a category and you had to keep on shouting out examples of that category or you lost the game. The nature of thought requires us to divide things into categories. This is good, because it facilitates learning. We need categories to begin to understand the multivalence of our world. To this extent, categories are our friends. As our understanding progresses, we begin to see the limitations – the false boundaries – of categories. As we grow, categories become our enemies. Architectural history is a good example. We begin by learning styles and periods. 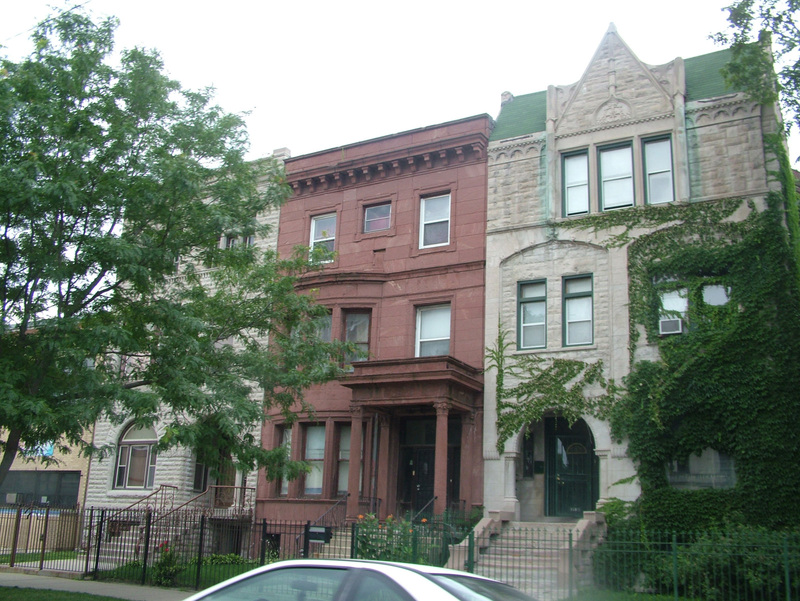 Federal, Italianate, Queen Anne, Richardsonian Romanesque, Beaux-Arts, Craftsman, Art Deco. 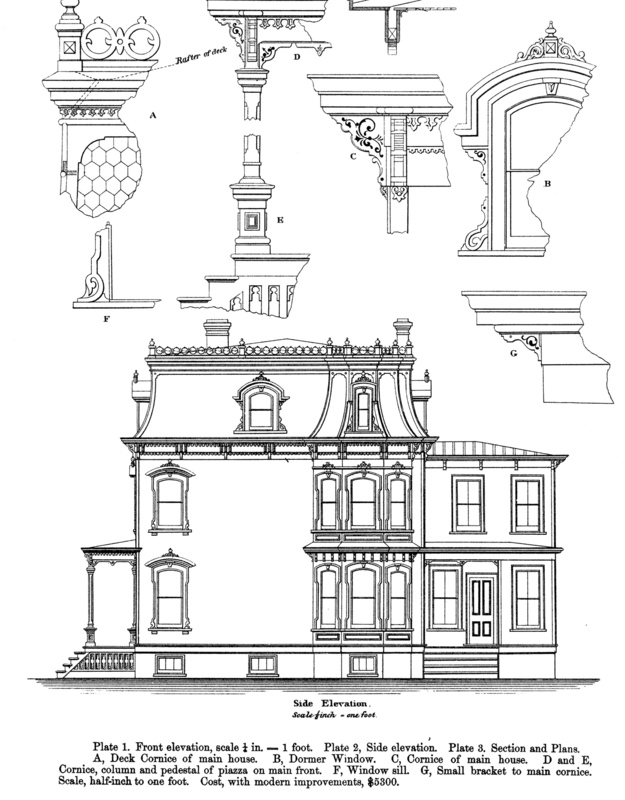 We study the defining characteristics of each of these styles and pretty soon we are able to survey buildings in the streetscape and categorize them. But these styles and periods begin to disintegrate the more deeply we analyze them. Most graystones and brownstones of the 1890s freely mix elements of Italianate detailing, Queen Anne massing, Richardsonian Romanesque masonry and even Beaux-Arts details. 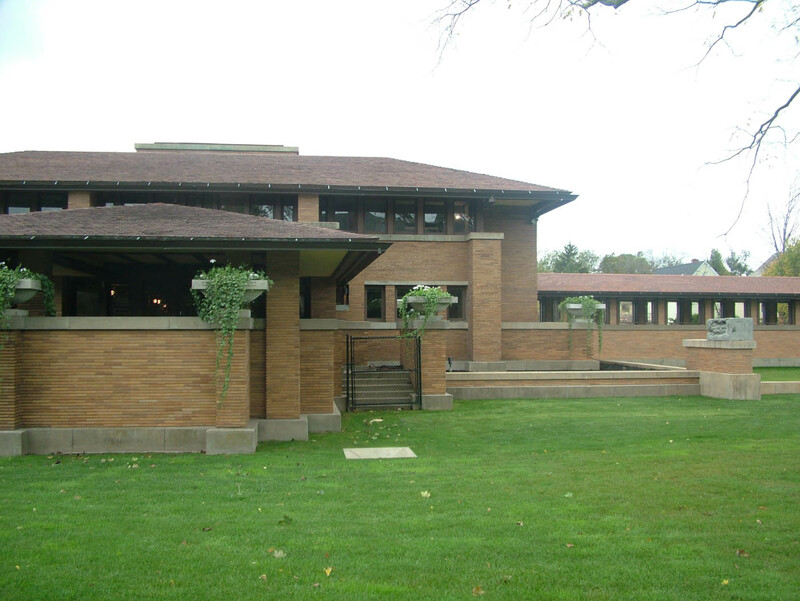 The more closely you look at individual buildings, you find designers and architects who were trying to be original or at least contemporary and the later periodization – the categories – played no part on their process. The first architectural style book I bought in 1983 illustrated two categories: Eastlake and Queen Anne – with the same building. As I collected more such books, I found that no two even had the same categories, or used the same terms for categories. Is it NeoClassical or Beaux Arts? Is there a Second Renaissance Revival? Is bungalow a style or a type? What is Neo-Grec and why do New Yorkers find it everywhere? When is Brutalism expressionistic? Does that mean the categories are incorrect? Of course. Does that mean we should dispense with them? Of course not. They are our vocabulary, or perhaps our alphabet or characters. We need these categories to initiate the process of learning. When that learning has progressed to understanding that categories are imprecise and fluid and that there are permeable membranes between them, they have done their job. The problem, like the problem of authenticity, comes about with time, the fourth dimension. Authenticity is a slice of time, a moment we wish to preserve that we cannot, because all things exist in time and our conception of authenticity rests in the moment. Categories (like ideologies) are static conceptions that must fail when confronted with the fourth dimension. Art and architectural history do a good job with categories because they use them to define time-based periodization, but of course these categories don’t work for an individual artist. 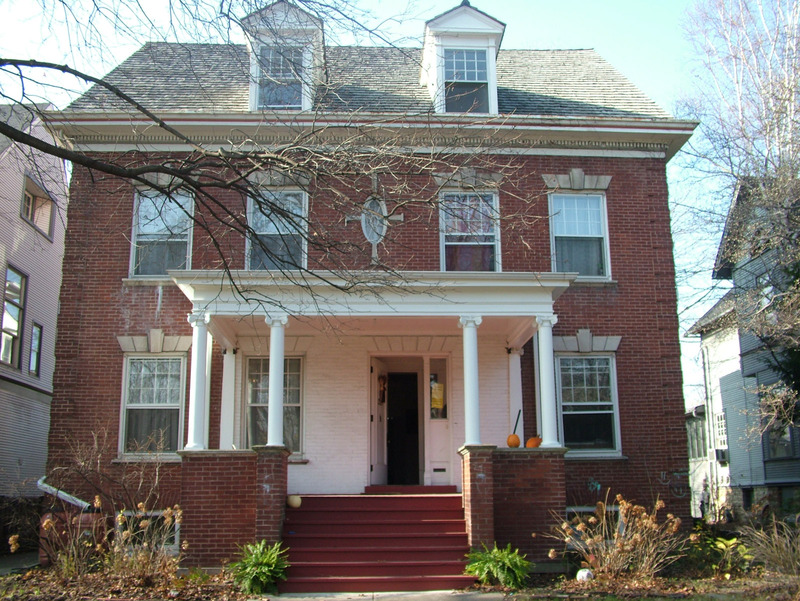 The architect of my house designed in the Queen Anne, Colonial Revival, Georgian Revival, and Prairie School styles at different times. Available for rent this August. I call it a pseudo-Georgian because the detailing is Georgian but the plan (see where the door is?!) is Victorian Queen Anne. And it has steel beams, so it is modern. If you hold too closely to categories, they will be more enemies than friends, and the more I think about it, I see this as a Western problem, culturally. My colleague Stanley Murashige, who is leading our Historic Yunnan Study Trip with me this week, gave a great lecture last night on Chinese philosophy – specifically Confucianism and Daoism. The distinction between how we view things and how Eastern philosophy views things is incredibly relevant to this discussion. 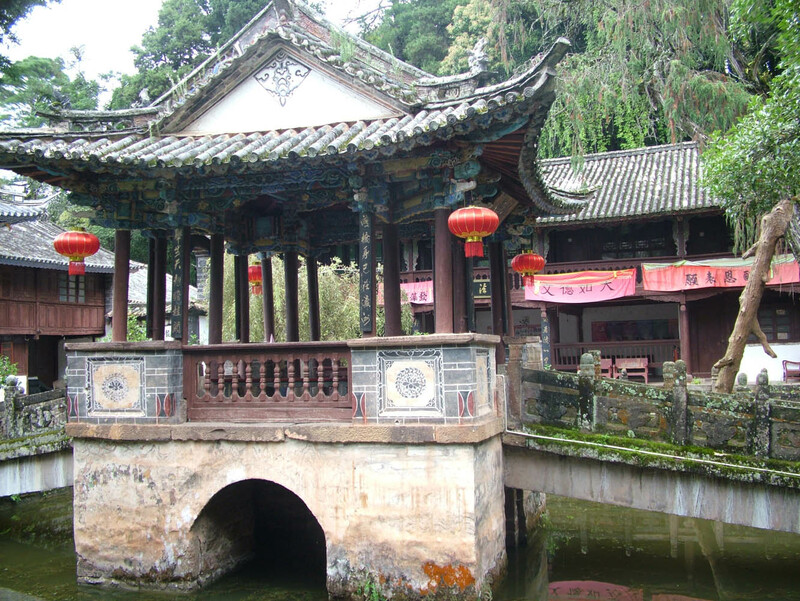 Mostly because the Chinese worldview does not consider THINGS; it is a view of PROCESSES. In other words, everything is seen through the filter of TIME. This is the Dao, which is translated into English as THE WAY, which sounds like a static category, but a more accurate translation would be “to trod the path” because it is more verb than noun. Even people are categories in English but processes in Chinese. The autonomous individual so central to Western thought (ignore John Donne for now) is, as Stanley said, a “crazy concept” for the Chinese. People are defined not as things but as acts of becoming within society. As time passes, the relationships and roles of each person shift. There is no autonomous self that stands outside of these changes. 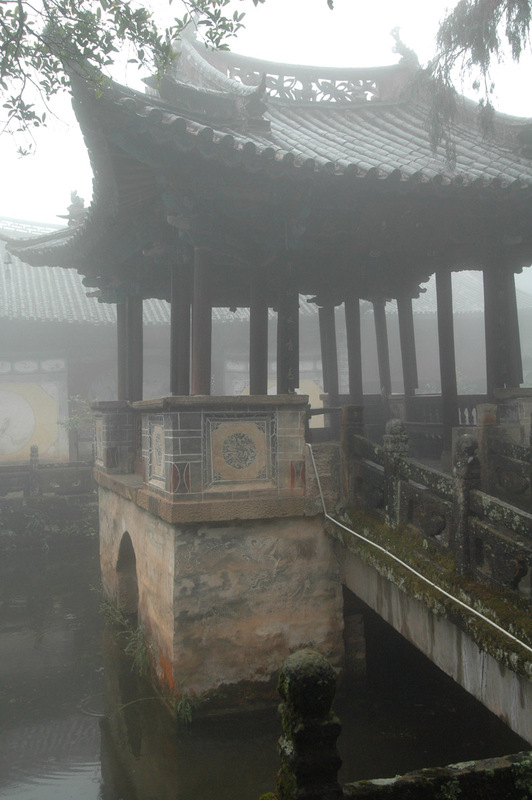 Cartesian dualism gives us a world of appearances and a world of reality, but in Chinese thought there is but one world. Knowledge itself is a gerund as well, not a collection of facts but a performative tracing of a path through a dynamic world. Let me bring this back to my business and the business of this blog, which is heritage conservation (historic preservation). This too, is not a thing but a process, as I have told many a lawyer to their dismay. A community determines what is significant in its past, how it is significant, and develops treatments for bringing it into the future. And they do it over and over again through time. 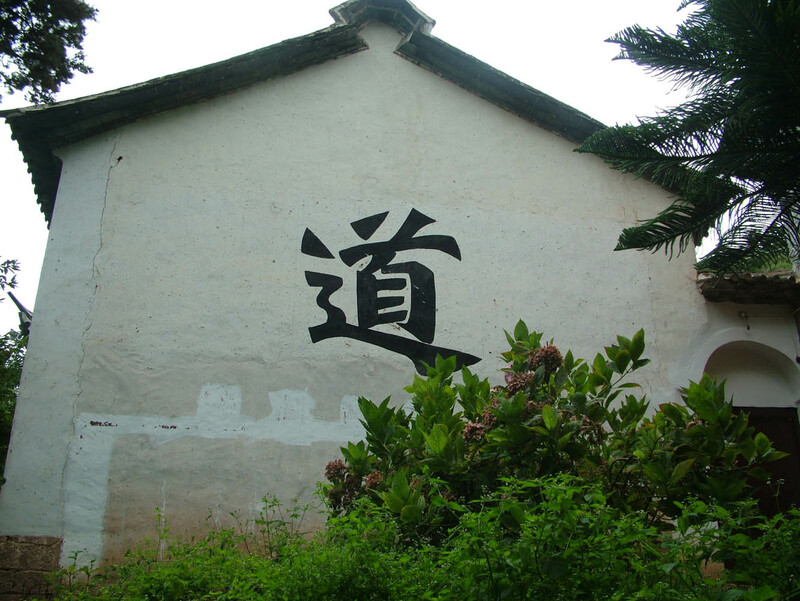 There is not a right treatment or a right answer for every situation or every time, but there is a PROCESS of context (heritage), identification (survey), registration (inscription, listing, planning) and treatment (conservation) that is consistent across a range of communities, cultures, and contexts. 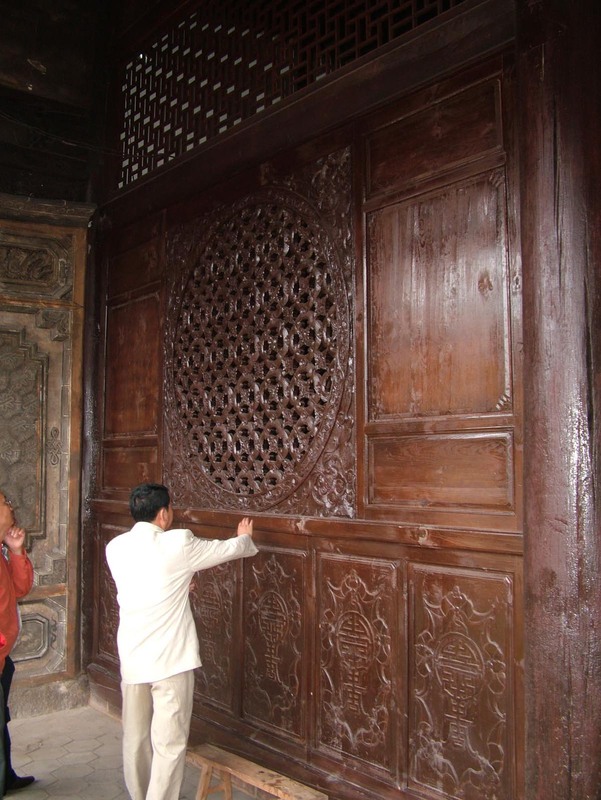 Heritage Conservation trods a path. There are no universal truths but there is universal truth. Use categories as you learn. Then, as you tread your path again and again, watch as they resolve into the foggy dew. 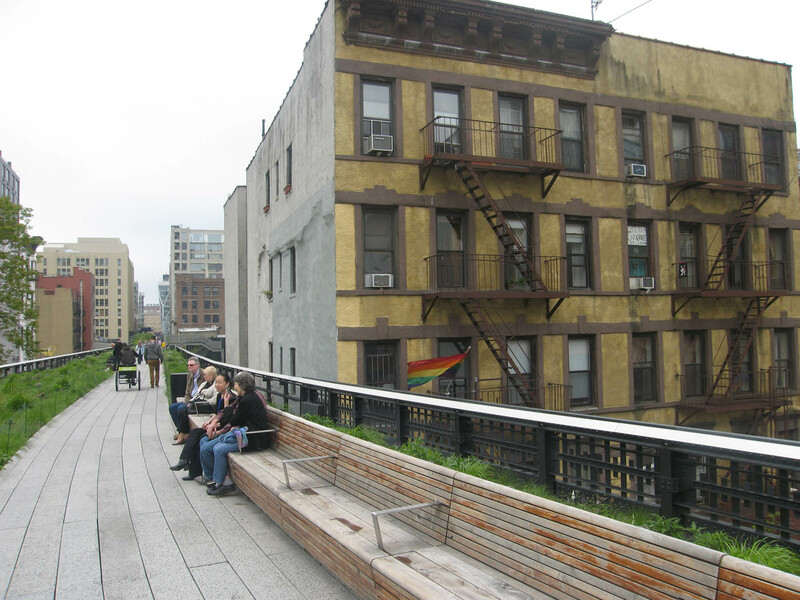 Bad weather for flying gave me an extra eleven hours in New York City so I decided to visit the High Line, which is to urban design what Facebook was to social networking in 2008 or what the iPhone was to telephony in 2007. Even though rails-to-trails are older than my creaky knees, the High Line has been HOT, HOT, HOT. Every city that wants to have the coolest in infrastructural fashion is getting one. 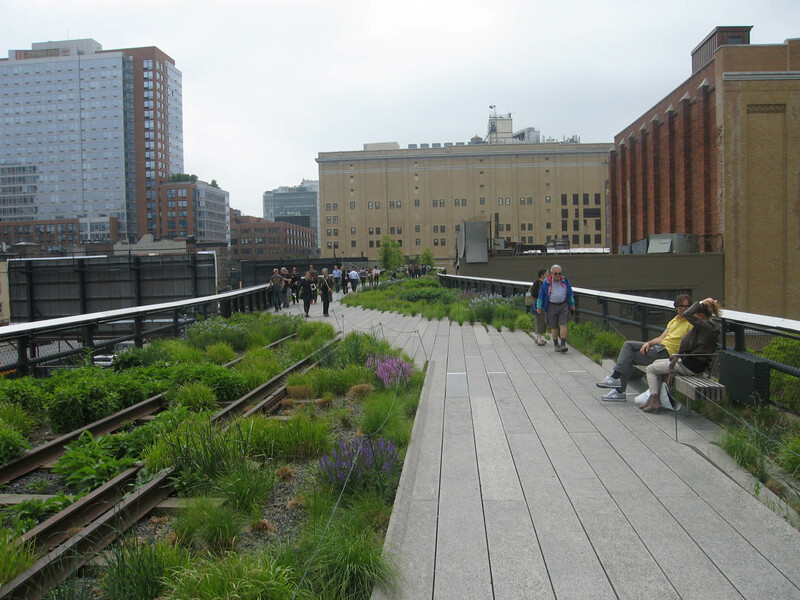 Chicago’s Bloomingdale Trail is the premier project in town largely thanks to the High Line analogy. So I had to see it and here are my impressions. As I said, there is nothing new about rails-to-trails – I grew up near the Prairie Path, a biking route on an old railroad right-of-way, and even the Civilian Conservation Corps was converting a canal towpath to a recreational trail and park way back in 1933. 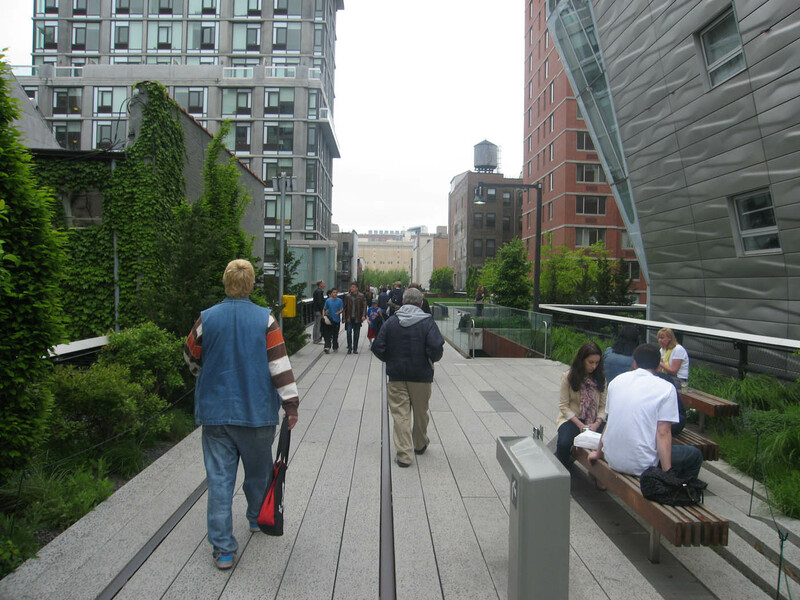 The High Line is different. First off, it is elevated. Again, that by itself is not unique, but the conversion to a trail and park becomes an overlay on an already dense city, not unlike the stacked elevator parking garages near its southern end. The elevation also removes it from the urban everyday and thus grants a sense of escape and relaxation. Traditional urban parks used berms or lines of trees to screen the city/ Here, the city is not screened, but you are at a remove from it. Second, it is more park than trail. Filled with benches and overlooks and public art, this is a place for people to relax, to promenade, to entertain children, to visit. The relaxation implied by the separation from street level is enhanced by ample plantings – a balanced, colorful and well textured collection of fauna from trees to ferns to flowers. 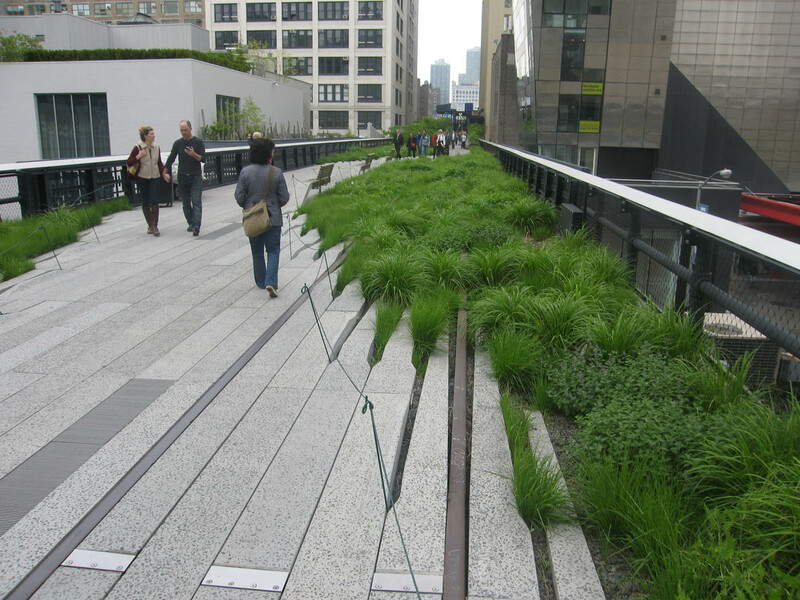 But unlike Chicago’s Lurie Garden in Millenium Park, it is not overplanted. I watched a bird flitting in among the brush below me at a section near 23rd street that was bi-level. This is a nicely designed park. 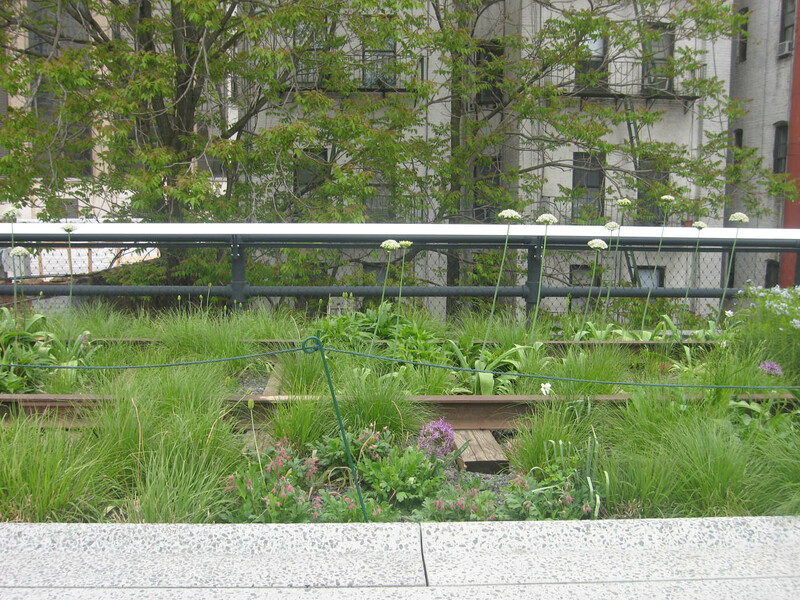 I love the section where the rails and plants are visible and it seems like little more than an overgrown old railroad track. While this is driven by the sense of urban palimpsest it is not overdone in an 80s gritty-chic way but it is delicately toned and when I say that I am smelling it and hearing it too – it is not patchouli but a whiff of lavender..
That is because other sections of the High Line revel in their design: the pavement buckles in deliberate bevels to allow the plants in on sharp but controlled angles, shading in and out of nature with a jagged edge that does not read as a jagged edge but a controlled collage of concrete and greenery. Like the great urban parks of the 19th century, the design has a romantic asymmetry, compelling natural focus but also a reassuring sense of human design. Like those old parks, we have a controlled nature that says: You Can Relax Here. As a peripatetic 21st century person, I find it hard to relax, but this design did it to a very real degree. I sat for long stretches. 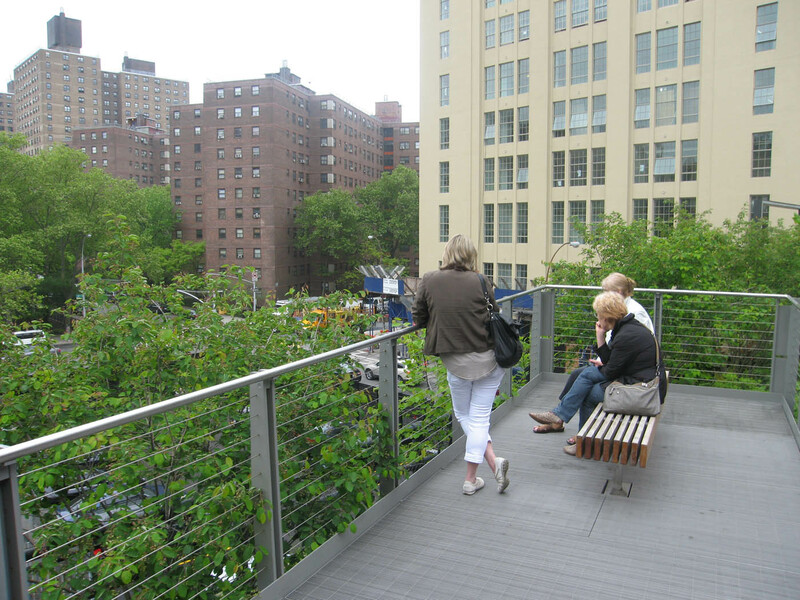 The design also has lots of benches – different kinds, some rising up from the paving in the same material, some in laminated wooden platforms that feel like the rooftop urban decks. The pathway shifts, not always following the tracks, which are sometimes over there amongst the plantings, sometimes under your feet flush with the pavement, sometimes vanished altogether. This is not a slavish design afraid to depart from its origins, nor is it hubritic design that trashes or violates its origins. 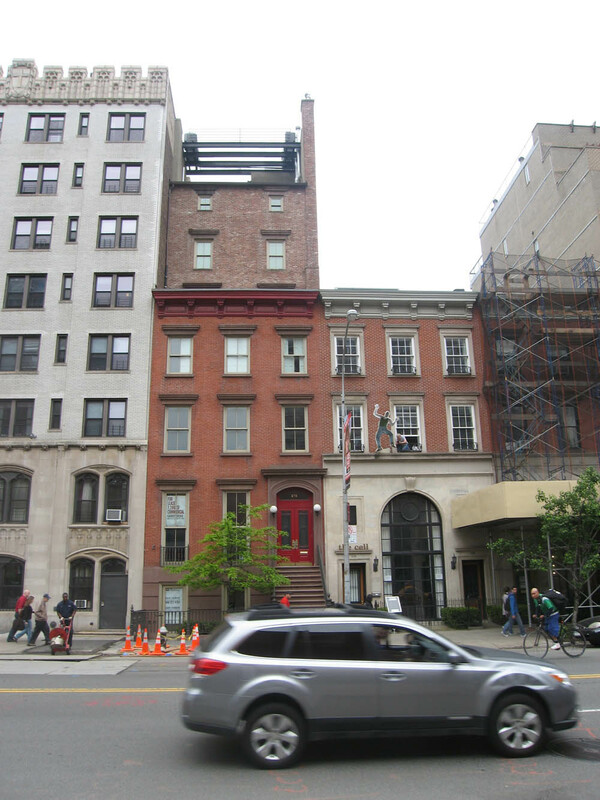 In this sense it is the highest form of preservation, conservation and adaptive re-use. It creatively appropriates the past, injects it with consonant and harmonic newness without denying its original existence. It makes it relevant by building on its relevance. 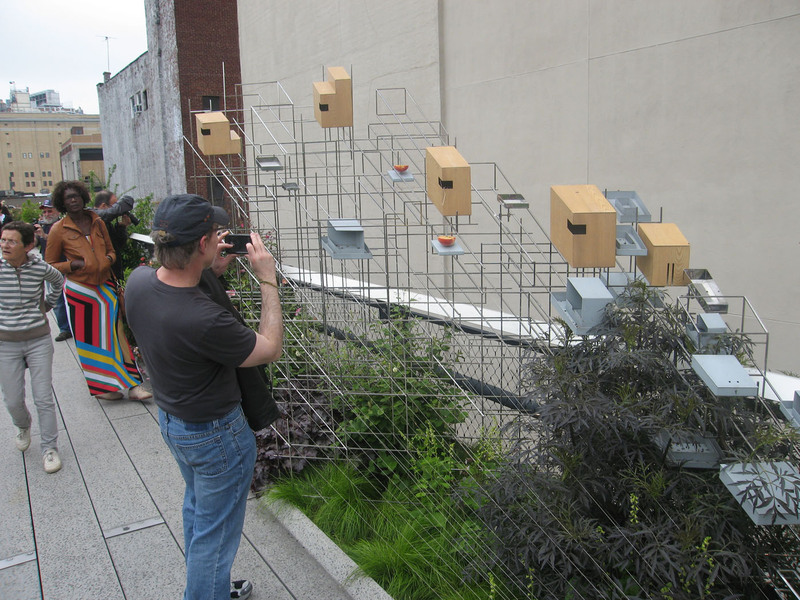 If you build it…the most amazing impression I had of the High Line on an overcast early May day was how successful it is. Like Millenium Park in Chicago, you can kvetch about costs and concepts and inconvenience if you want, but this thing is drawing pilgrims by the boatload. It was sometimes CROWDED. Everyone wants to be there and a few of them were even speaking English. It has interactive opportunities like art (not too much like Navy Pier does, but just enough) and the aforementioned opportunities to relax and interact. 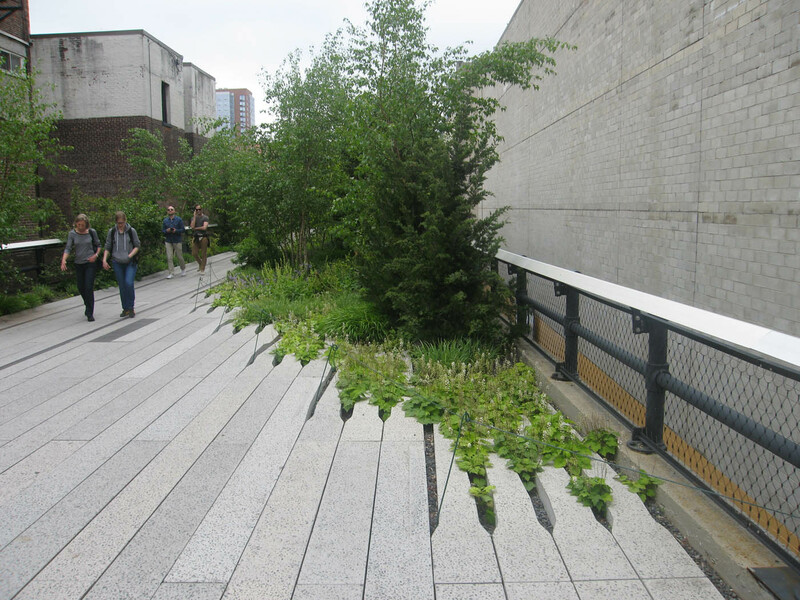 The most interesting feature to me about the interaction of design and use on the High Line are the overlooks – small or large sections of the platform designed to allow viewers to look out at the city. Often the view is unspectacular – an old warehouse street, an odd mix of housing project and commercial avenue, a construction site (lots of those). It is almost as if the overlooks are designed not because there is something to be seen, but because there is an opportunity for the overlook. 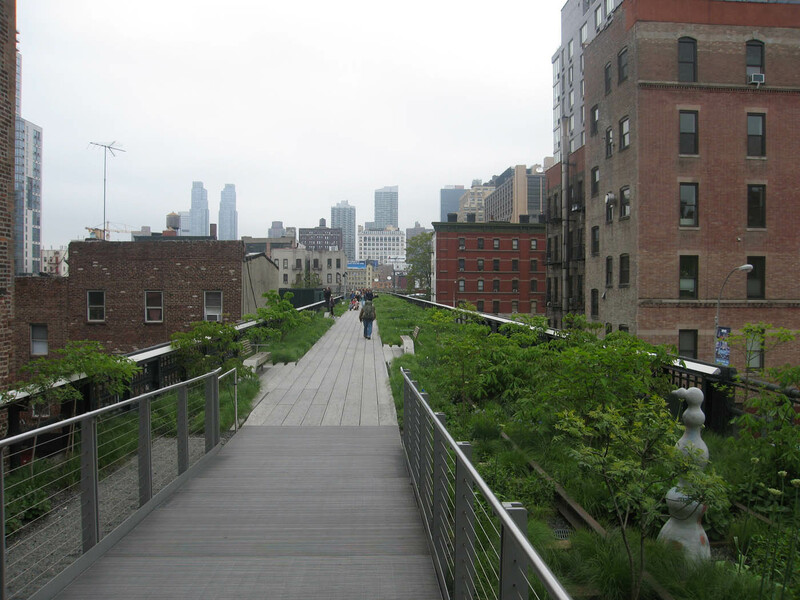 Urban parks were first designed as escapes from the city, an attempt to bring the humanizing and even moralizing lessons of nature and rural environments to the ennui of the modern industrial city. 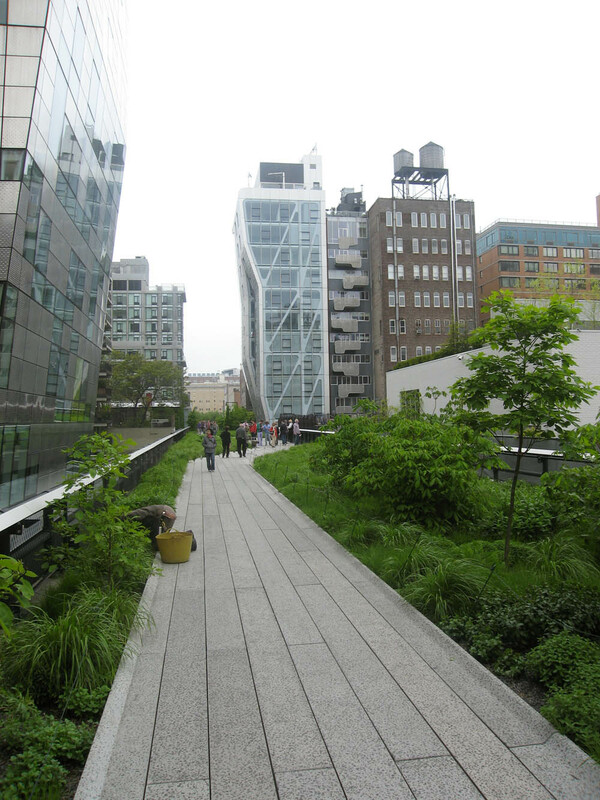 Now that that city is gone it is an object of nostalgia, and we can design parks that include the contemplation of both nature and the physical remnants of the industrial city. 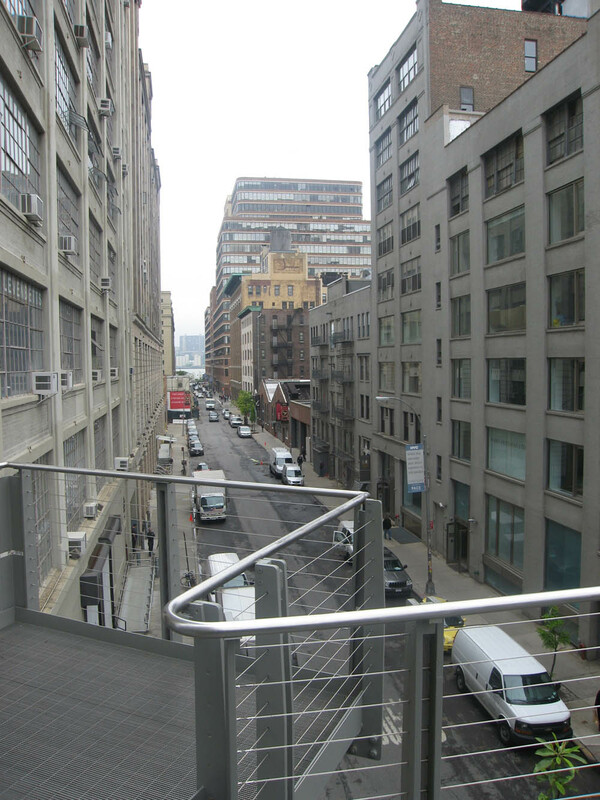 We rise above the streets on the High Line and reflect on the city below, enjoying the unusual view, the balanced design, the connection with many other people doing the same thing. We see the architecture of past and present, the urbanism of past and present, and we enjoy the city itself as a consumer product, not simple a setting for our hopes and desires, but a physical manifestation of them. 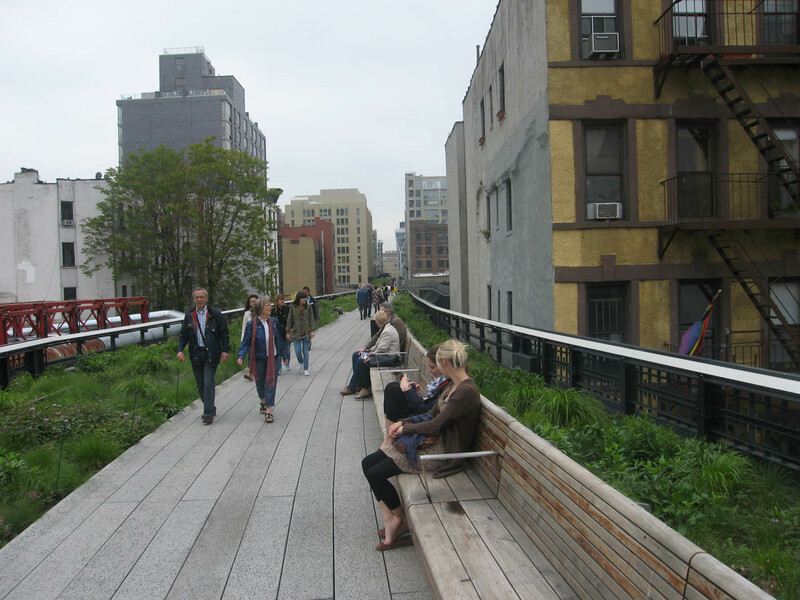 The High Line is 21st century urbanism because it recognizes the city itself as the primary object of our desire. You are currently browsing the Time Tells blog archives for May, 2012.